While Jimmy Shane's run of five straight national titles is likely ending, the Miss Madison team has a new Miss HomeStreet to show off this weekend at Seafair. Jimmy Shane and the U-1 Miss HomeStreet unlimited hydroplane team had a bad weekend in the Tri-Cities. Three disqualifications, including a DQ in the final at the Columbia Cup when Shane inadvertently washed down another boat, all but drowned his hopes for a sixth consecutive National High Points title. But the good news is Shane, who lives in Maple Valley, and the team get to play with their new toy this weekend on Lake Washington starting Friday. The Miss Madison team, sponsored by Seattle-based HomeStreet Bank, built a new hydroplane that saw the water for the first time in Kennewick. And the initial review from Shane was promising. The boat had two laps over 160 mph, and it wasn’t yet set up for racing action. New race boats are rarely ready right out of the box, and they take several races to work out bugs and get the most horsepower out of it. And as the Miss HomeStreet was already one of the top boats on the H1 Unlimited circuit (it nearly had a record qualifying speed in the Tri-Cities), why make the change midseason? Disqualifications in hydro racing mean no points are earned for the season-long total. And with Andrew Tate in the U-9 Les Schwab Tires having a near-perfect weekend, Tate built up a huge lead at the halfway point of the season. Tate has 5,280 points and Shane sits in third at 3,360. Shane’s streak is second best in hydro-racing history. Dave Villwock won seven straight titles to end the Miss Budweiser’s run (1998-2004). The Miss Bud also won five straight from 1991-1995 but with different drivers (hydroplane racing awards national titles to both boats and drivers). While Shane isn’t mathematically eliminated from continuing his stretch of five consecutive titles (one with Graham Trucking, the last four with Miss Madison), it would likely take something severe to the U-9 to get Shane back into it. So it’s time to work on the future. Building a new streak would mean borrowing from the Miss Bud team which dominated the 1990s through 2004 when Anheuser-Busch pulled its sponsorship and the team disbanded. The Miss Madison team, which is based in Madison, Ind., bought the Miss Bud shop in Tukwila, and with it came all the equipment that helped make that team so dominant. The new Miss HomeStreet isn’t a copy of the Miss Bud boats. It did use the mold for the sponsons, but there are major differences. So why rebuild a boat that has won eight of the last 10 national titles? The old boat had been through two major accidents, and “the pieces never go back quite as well as when you build it,” Shirley said. This new boat’s bottom is stiffer and pushes through the water better, Shirley said. The old boat, which is 11 years old, is starting to sag into the water. The new boat is also significantly lighter, Shane said. The new Miss HomeStreet is the first new boat on the circuit in eight years since Ellstrom team had to rebuild their boat after it caught fire in Doha, Qatar. The new Miss HomeStreet will be on display at Westlake Park in Seattle on Thursday from 11:30 a.m. to 1 p.m. 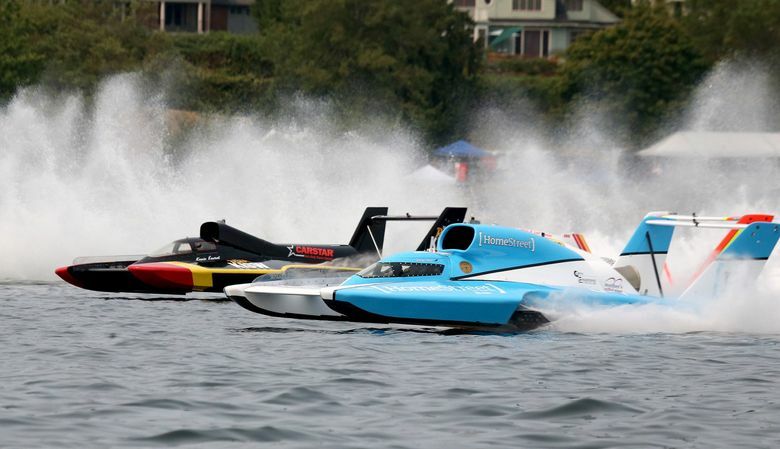 Qualifying for the Albert Lee Appliance Cup at Seafair is Friday at 4:55 p.m. Saturday’s heat is at 5:40 p.m. Sunday’s heats are 11:10 a.m. and 3:50 p.m. with the championship final at 5:30 p.m. The U-3, the only piston-powered boat on the circuit, apparently won’t be at Seafair. It headed back to Indiana after the Columbia Cup as its sponsorship deal for Seafair fell through, Jeff Morrow of the Tri-Cities Herald reported. H1 Unlimited announced Wednesday the series will be returning to Guntersville, Ala., in 2019. The season-opening race was added to the schedule this year. Seafair will have two smaller classes of boats running this weekend. The Grand Prix class will run as will the F1 Tunnel boats, which have been part of Seafair since 2012. The only TV coverage of the race is Sunday starting at 3 p.m. on KONG.